The Regina Pats expect to have F Filip Ahl back from a bout with mumps tonight (Friday) as they try to stave of elimination. They won’t have F Adam Brooks (knee) back, though. The feisty Swift Current Broncos, who were 1-7-0 against the Pats in the regular season, take a 3-1 lead in the best-of-seven second-round series into Game 5 in Regina. The WHL lost one of its division winners, the Prince George Cougars, in the first round. Two more, the Regina Pats and Everett Silvertips, could go by the wayside tonight. The other, the Medicine Hat Tigers, is 2-2 with the Lethbridge Hurricanes. I don’t know what it means, but it’s happening. Since the NHL playoffs began on Thursday, home teams are 3-5, with one of the two victories having come in OT. On Thursday, WHL home teams were 0-2. . . . BTW, each of the five Canadian teams that qualified for the NHL playoffs is 0-1. Of course, that means the Vancouver Canucks and Winnipeg Jets are the only Canadian team not to have suffered a loss this week. G Dylan Wells of the OHL’s Peterborough Petes scored a playoff goal last night in a 6-2 victory over the Kingston Frontenacs. The Petes swept the series, 4-0. . . . There is a good video of the goal right here, starting at the 2:47 mark. . . . BTW, Well’s NHL rights belong to the Edmonton Oilers. He’s stopping pucks, too. He’s 8-0, 1.94, .944 in these playoffs. Just spitballin’ here, but might there be a chance that Kamloops Blazers head coach Don Hay could end up on the coaching staff of the Dallas Stars? Tom Gaglardi, the Stars’ owner and the majority owner of the Blazers, is a huge Hay fan. Ken Hitchcock, who returned to Dallas as head coach on Thursday, and Hay worked together in Kamloops back in the day and remain close. Hay, 63, still loves coaching, but maybe he has had enough of bus travel, at least for now? If you’re old enough, you likely will remember when cross-checking was a penalty. The City of Vancouver will be a lot poorer if Rhonda and Willie Desjardins move elsewhere, now that he no longer is the Canucks’ head coach. Desjardins said farewell at a news conference on Thursday, and during his remarks he apologized to the city for the lack of positive results during his three-year run. He’s a person you really want to see given the opportunity to coach a team with better players than the mess he dealt with this season. As Willie Desjardins contemplated signing with the NHL’s Vancouver Canucks three years ago, he also had an opportunity to join the Pittsburgh Penguins. He went with the Canucks because it felt right and because Trevor Linden was firmly ensconced there as the president of hockey operations. Desjardins and Linden both had come out of the Medicine Hat Tigers organization, so there was that. At a Thursday news conference, Desjardins thanked a whole lot of people, including owner Francesco Aquilini and general manager Jim Benning. Desjardins didn’t mention Linden. The Toronto Blue Jays are 1-8 and Josh Donaldson didn’t bring rain on Thursday; rather, he brought fans to tears as he limped off the field, a strained calf muscle proving to be too much. Sheesh, this could be a long, long season for the cheerleading team of Buck and Pat. Followers of the second-round WHL playoff series between the Portland Winterhawks and Kelowna were waiting on Thursday to see whether F Carsen Twarynski of the Rockets would be suspended before the teams meet for Game 5 tonight in the Little Apple. during what has become a fractious series. 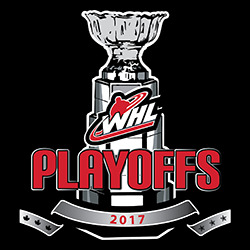 The Rockets hold a 3-1 edge, with the Winterhawks needing a victory tonight in order to force Game 6 in Portland on Sunday. On Wednesday night, the Rockets posted a 7-2 victory in Portland in a game that featured 121 penalty minutes, 101 of which were doled out in the game’s last four minutes. The Winterhawks took 64 of the 121, but the two penalties that may have mattered the most went to Twarynski, who was hit with a boarding major and game misconduct at 16:12 of the third period. Prior to Game 4, the WHL hit three players with TBD suspensions, all under supplemental discipline. The Rockets lost D Cal Foote, who had elbowed Portland F Skyler McKenzie in the head. The Winterhawks have said that McKenzie, who was scratched from Game 4, has a concussion. The Winterhawks lost F Alex Overhardt and F Evan Weinger to suspensions. Overhardt hooked Kelowna D Braydyn Chizen to the ice during a bit of a scrum. Chizen left the ice with an apparent leg injury and didn’t return. He didn’t play on Wednesday night. Although the WHL doesn’t provide much in the way of explanations when issuing suspensions, Weinger is believed to have cross-checked Kelowna F Erik Gardiner, who was scratched from Game 4. On Thursday, the WHL put numbers to those suspensions. Foote ended up with three games, meaning he will miss his club’s next two games, while Weinger got two games, so will sit out tonight, and Overhardt got one game, so is eligible to play tonight. Twarynski, meanwhile, was placed on the TBD list, meaning he won’t play tonight. Twarynski hit Portland F Keegan Iverson from behind. Iverson didn’t appear to be injured, though, something that could have an impact on the length of Twarynski’s suspension. It’s a disease. It really is. really is so deep as to be unfathomable . . . unless you are one of them. On May 26, the NHL’s St. Louis Blues and Ken Hitchcock announced that he was returning for one last season as head coach. At a news conference, Hitchock said that he realized two days after the Blues’ 2015-16 season ended that he only had one more season in him. "We have a 12-month clock as coaches," Hitchcock said. "A fanatical clock that we run on and the 12-month clock is the clock in the offseason. And the clock in the offseason is the stuff that I start doing in July, and I'm gunned up and ready to do the stuff I need to do in July and August this year to get ready for next season. "You have to sign up a year in advance, and the stuff I do to get better to stay current, which quite frankly really helped us this year in some areas, those things have been on my desk for two months and I'm not willing to sign them. If you're not willing to sign them, it means you're ready to flat-line and you're going to go backwards. I thought the playoffs, getting through it, I'd take a look at it again and I'm not willing to do it, so I'm done. So to me, I'm ready to go for next year, I'm excited. This is an unbelievable group of guys with a lot of potential and I'm ready to do it, but if I'm not going to get better myself during the offseason, then I'm doing a disservice to the hockey club and I'm not going to do it." Of course, Hitchcock didn’t make it to the end of his last season, as the Blues fired him on Feb. 1. 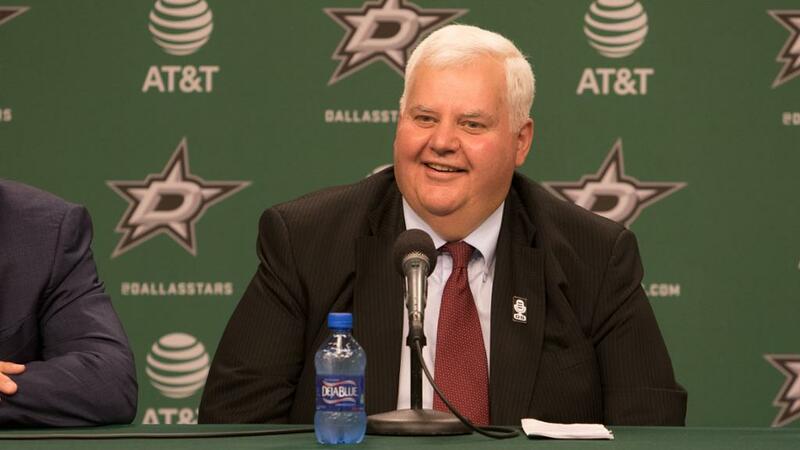 On Thursday, Hitchcock, 65, was in Dallas where he was introduced as the Stars’ new head coach. Never mind that this season was going to be Hitchcock’s last rodeo, he now has a multi-year deal with the Stars, one that will spin him into a consulting role when either he or the team decides that the coaching is over. This is Hitchcock’s second go-round in Dallas, where he helped the Stars to five straight division titles and a Stanley Cup title in 1999, before he was fired in January 2002. He will tell you that after he was fired by the Blues, he felt like he was done. But in the weeks to come he had conversations with numerous coaches at various levels of the game and it was as though someone hit the refresh button . . . or like the coaching bug bit him all over again. The Moose Jaw Warriors have signed D Chase Hartje, 17, who is from Bemidji, Minn. This season, Hartje played high school hockey in his hometown, putting up 25 points, including 21 assists, in 25 games with the Bemidji High Lumberjacks. He also got into nine games with the NAHL’s Bismarck, N.D., Bobcats, recording six points, including two goals. . . . A list player, Hartje has been in the Warriors’ training camp prior to each of the past two seasons. Officials with the Victoria Royals are shaking their heads at an online report in the Victoria Sports News that claims head coach Dave Lowry has been in talks with the NHL’s Vancouver Canucks and also has spoken with the WHL’s Vancouver Giants. According to a piece written by Christopher Kelsall, “An anonymous, but a reliable source close to Victoria Sports News as well as the Victoria Royals Western Hockey League franchise, claims that Dave Lowry has been talking to the Vancouver Canucks for at least six weeks. . . .
Never mind that the Giants already have a head coach, Jason McKee, and that he has two seasons remaining on his contract. Oh, and let’s not forget that, according to the Royals, neither the Canucks nor the Giants have asked for permission to speak with Lowry. D Chaz Reddekopp of the Victoria Royals has signed a three-year entry-level contract with the Los Angeles Kings, who selected him in the seventh round of the NHL’s 2015 draft. Reddekopp, from West Kelowna, B.C., has played four seasons with the Royals. This season, he had 10 goals and 33 assists in 55 games. He missed time late in the regular season after breaking an ankle while blocking a shot. Earlier this week, he joined the Ontario Reign, the Kings’ AHL affiliate. Canada won its first game at the IIHF U-18 World Championship on Thursday, beating Latvia 4-1 in Poprad, Slovakia. F Stelio Mattheos of the Brandon Wheat Kings had one of Canada’s goals, scoring on a first-period penalty shot. . . . G Ian Scott of the Prince Albert Raiders earned the victory with 17 saves. . . . Canada next plays on Saturday when it meets the host Slovakian side. . . . The Canadian roster includes five other WHLers — defencemen Josh Brook and Jett Woo of the Moose Jaw Warriors and Ty Smith of the Spokane Chiefs, and forwards Jaret Anderson-Dolan of Spokane, who is the team captain, and Kyle Olson of the Tri-City Americans. As of April 7, the City of Nanaimo had spent $858,961 on what some people there had hoped would be a new events centre. You may recall that Nanaimo held a referendum on March 11, with the City looking for the OK to borrow $80 million in order to build an events centre that would have been home to a WHL franchise, presumably the Kootenay Ice. The Nanaimo News Bulletin reports that the referendum alone cost taxpayers $166,906, which was well above the budgeted figure of $130,000. The City also spent hundreds of thousands on planners and consultants, etc. “Nanaimo city council started to explore a potential sports and entertainment centre last year after naming it a strategic priority, hiring consultants to holding open houses with the public,” writes Tamara Cunningham of the News Bulletin. “It held a referendum in March on borrowing up to $80 million over 20 years to build the centre, which saw a 35.3 per cent voter turnout and 80.3 per cent of residents reject the borrowing.” . . . The story is right here. The BCHL’s Alberni Valley Bulldogs have relieved Kevin Willison of his duties as general manager and head coach. Willison had been head coach since Dec. 7, 2011. Before signing with the Bulldogs, he had been head coach of the AJHL’s Olds Grizzlies. . . . The Bulldogs made the playoffs in four of Willison’s five seasons. They didn’t qualify this season, as they finished 16-32-7-3, good for fifth place in the five-team Island Division.